Viewing 3D film with the stunning 3D effects on Samsung 3D Smart TV is so amazing, have you thought of putting your backed up 3D Blu-ray ISO files on your large screen Samsung 3D Smart TV instead of going to a theater which is fairly costly? However, Samsung 3D Smart TV will get playback issue when loading 3D Blu-ray ISO files via USB. (read top 5 3D TV review). In fact, Samsung 3D Smart TV can’t play 3D Blu-ray ISO video format via USB, the 3D Blu-ray ISO file cannot be read, so if you copy movies 3D Blu-ray in ISO format to USB flash drive and play on 3D TV, the 3D TV will not find the 3D Blu-ray ISO file or the player will get playback issue. And generally the 3D Blu-ray ISO files are large. In this case, a professional 3D Blu-ray ISO to Samsung 3D Smart TV Ripper is the key to assist you to rip your 3D Blu-ray ISO to 3D TV supported video formats for your smooth playback on Samsung 3D Smart TV with 3D effects. 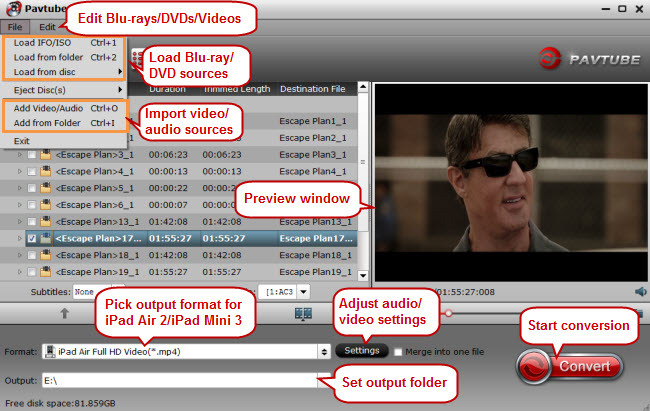 If you are a Mac user, please turn to ISO Ripper for Mac for creating 3D movies on Mac. If you haven’t got the software, download it now and let’s start the conversion. How to Convert 3D Blu-ray ISO files to Samsung 3D Smart TV supported videos with 3d effect? Step 1. Launch the 3D Blu-ray ISO ripping program. Then click “Load file(s) > Load IFO/ISO” to import the ISO files you want to convert. To select the subtitles you like, simply click Subtitle and select the one you prefer. Step 2. Click Format bar and choose your desired format. To play ISO on Samsung 3D TV, you can rip ISO to .mp4, or .avi, .mkv, etc compressed format with 3D effect. Here “MP4 Side-by-Side 3D Video (*.mp4)” from “3D” is recommended And click Settings bar, you can adjust the level of compression to suit the quality you want. Step 3. Hit the “start conversion” button to rip iso to Samsung 3D TV. After the conversion, click Open button to find the output files. Stream converted files to Samsung 3D TV via USB and then just watch the high quality ISO movies with large screen anytime as you like. Just have a try.